From the moment Caroline and Bryan became engaged, Caroline knew Keeneland was the only place for their wedding. She grew up 10 minutes from the track, and since her Dad was in the horse industry, spent much of her childhood here. It quickly became one of Bryan’s favorite places as well, and the couple made many trips to Keeneland while they were dating. In our opinion, Keeneland is the most beautiful place in Kentucky and it is the perfect backdrop for a wedding. Keene Place is romantic, full of history, and the scenery is gorgeous. To us, Keeneland was our only choice. The couple created their menu with one important goal in mind – to ensure the food offerings catered to a wide audience and included vegetarian and vegan options. Food stations offered an array of seafood (citrus poached jumbo shrimp, snow crab claw, oysters on the half shell), pasta (gnocchi, vegetable ravioli with foraged mushrooms, penne with asparagus and sauce bolognese) and a sliders featuring grilled Portobello mushrooms, kobe beef, Maryland crab cakes and pulled pork. A gourmet cookie and ice cream bar was the perfect end to the evening. What feeling or style were you trying to channel with your décor and color pallete? 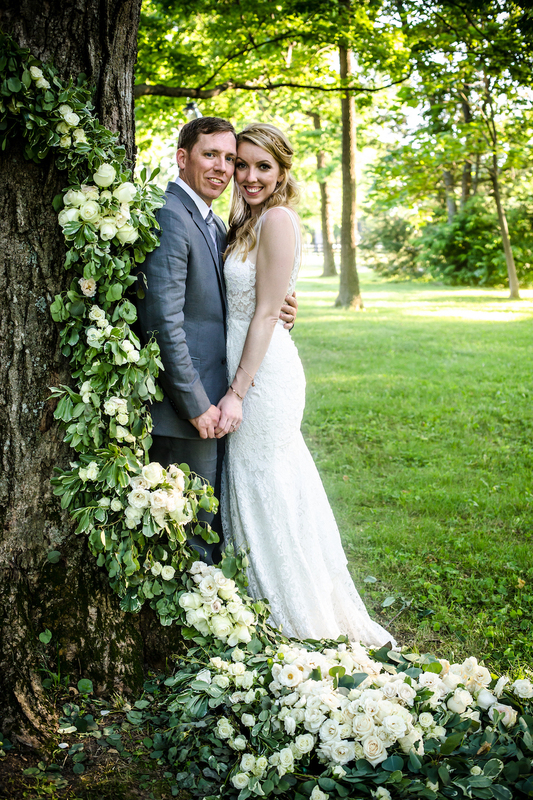 "First, we would never have had the wedding of our dreams if it were not for Rayna Wallen at Lunasa Events. She definitely captured everything we wanted and more. For the color palette, we knew we didn’t want anything too loud so we stuck with what we call “elevated neutrals.” The flowers for the wedding were beautiful ivory and champagne peonies and roses accompanied with lush greenery. My engagement ring is rose gold and that color was also prominent in our wedding decor. The decorations were pure Southern charm and elegance. Kentucky is, after all, the horse and bourbon capital of the world and we wanted that to shine. From the bourbon barrels at the aisle adorned with stunning floral arrangements, to the mint julep cups for vases, we wanted everyone to experience all the beauty that Kentucky has to offer." What was your favorite part about the day? "How do we pick just one part? The entire day was amazing! After much debate, we truly believe the best part of our day were those moments underneath that beautiful tree where we said “I Do.” Our close friend Matt officiated the wedding, which made it that much more meaningful.​"
What advice do you have for those newly engaged who are currently planning a wedding? "First, congratulations! This is such a special time so be sure to just take a moment and enjoy being engaged. Then take a deep breath and start planning … this is fun, we promise. It was important to us that our wedding be a representation of us as a couple. From planning the band to the food we served, we did it together. If you don’t live in the city where you are getting married, then a planner is a must. Rayna at Lunasa Events is an amazing wedding planner. Her designs are beautiful. We were also super fortunate to have Morgan from Keeneland as well. Morgan and Rayna both took time in the months and weeks leading up to our wedding to meet with us and ensure it was everything we wanted. 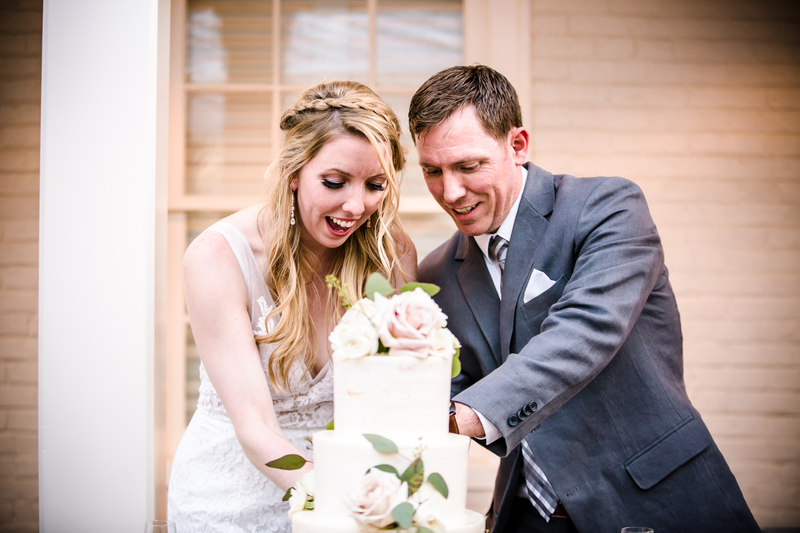 These two handled all wedding day logistics, which allowed us to relax and truly enjoy our special day."